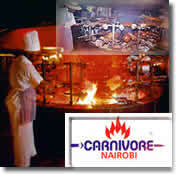 The Carnivore restaurant is considered 'Africas Greatest Eating Experience'. This open-air meat speciality restaurant has strikingly different food, service and atmosphere to anything ever seen in Kenya. Every type of meat imaginable, including four choices of wild game, are roasted on traditional Maasai swords over a huge, visually spectacular charcoal pit that dominates the entrance of the restaurant. The waiters then carry these swords around the restaurant, carving unlimited amounts of the prime meats onto sizzling, cast iron plates in front of you. A wide selection of salads, vegetable side dishes, and a variety of exotic sauces accompany the meat feast. Dessert and coffee follow this. The full meal including a soup course is at a set price. Nairobi Carnivore Experience Kenya a carver at Carnivore The Charcoal Grill Pit Ranked among the top 50 Restaurants in the world, the world famous Carnivore is a must for anyone who loves Barbeque. This is a Barbeque with a difference in that not only do they serve your normal beef, pork and chicken but Game meat as well. Giraffe, Gnu, Zebra, Crocodile, Hartebeest and Ostrich are some of the specials that you will find on the menu. The meat is Barbequed on a huge charcoal BBQ right at the entrance to the restaurants. The meat comes with special sauces which are Carnivores secret. Carnivore is an all you can eat restaurant and you are guaranteed very good wining and dining. 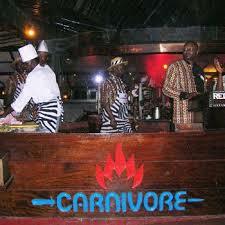 The Carnivore is also the home of the Simba Saloon, Nairobi's most popular nightclub and disco. The informal outdoor atmosphere, exceptional snacks and outstanding entertainment ensure a vibrant and exciting night out. Guaranteed daily at 12.30 p.m and 7.00 p.m.Nairobi has many restaurants offering varieties of cuisines.We recommend a dinner or lunch at the carnivore which is famous for the succulent stew and barbecue dishes of the Game meat as an excellent welcome or farewell dinner.